Willis Yoder: mission worker and pastor of the Bethany Mennonite Church at Smith, Alberta, born on 13 July 1909 at Windom, Kansas, and died at the Royal Alexandria Hospital in Edmonton as a result of injuries suffered in an automobile accident, on 1 March 1985. He married Florence Erb (25 July 25 1909-22 September 1983) on 12 May 1932. They were the parents of two sons and one daughter. Willis Yoder grew up and became an active participant in the life and work of the West Zion Mennonite Church near Carstairs, Alberta. He was a strong supporter of the Winter Bible School of the Alberta-Saskatchewan Mennonite Conference where a greater involvement in mission work was emphasized. In 1946 he was one of four members of the conference's Mission Board who travelled to northern Alberta to investigate new mission opportunities. He was particularly impressed by the situation in Mirror Landing, later renamed Smith, Alberta. He followed up that exploratory trip with bi-weekly trips to hold Sunday School and worship services in Otter Creek, Ranch, and Moose Portage - all in the Mirror Landing district - during the summer and fall of 1946. 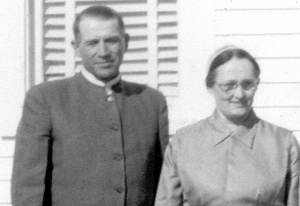 On 28 November 1946 he was ordained in the West Zion Mennonite Church near Carstairs for mission work in and around Smith, and in December of the same year the Yoder family moved north. A small Mennonite congregation, meeting in several different locations, was organized on 5 October 1947. Willis Yoder pastored that congregation until 1977 and remained an active member and participant in the church until the time of his tragic death in 1985. Willis and Florence Yoder received only minimal financial support from the conference. Their main source of income was a marginal farm, kept afloat by Florence 's managerial skills since Willis's mission work often seem to take priority over more prosaic farm work. Willis devoted himself wholeheartedly to Christian witness and service. His preaching style was often didactic, but enriched by practical illustrations form everyday life. He was an active organizer and participant in community programs and activities which he approached in a straight-forward no-nonsense manner. The Yoder home was always a place of warm hospitality, ever sensitive to the spiritual needs of those with whom he came in contact. Florence, through her sacrificing service, provided stability in a sometimes unpredictable and chaotic household. Articles by several colleagues, published in the Newsletter of the Northwest Mennonite Conference (Spring 1987), after Willis Yoder's death. Obituary Notice for Willis Yoder in the Gospel Herald. Stauffer, Ezra. History of the Alberta-Saskatchewan Mennonite Conference. Ryley, Alberta: Alberta-Saskatchewan Mennonite Conference, 1960. Regehr, Ted D. "Yoder, Willis (1909-1985)." Global Anabaptist Mennonite Encyclopedia Online. December 2003. Web. 19 Apr 2019. http://gameo.org/index.php?title=Yoder,_Willis_(1909-1985)&oldid=143240. Regehr, Ted D. (December 2003). Yoder, Willis (1909-1985). Global Anabaptist Mennonite Encyclopedia Online. Retrieved 19 April 2019, from http://gameo.org/index.php?title=Yoder,_Willis_(1909-1985)&oldid=143240.